Hi Lovelies! What a treat we have to share with you today! 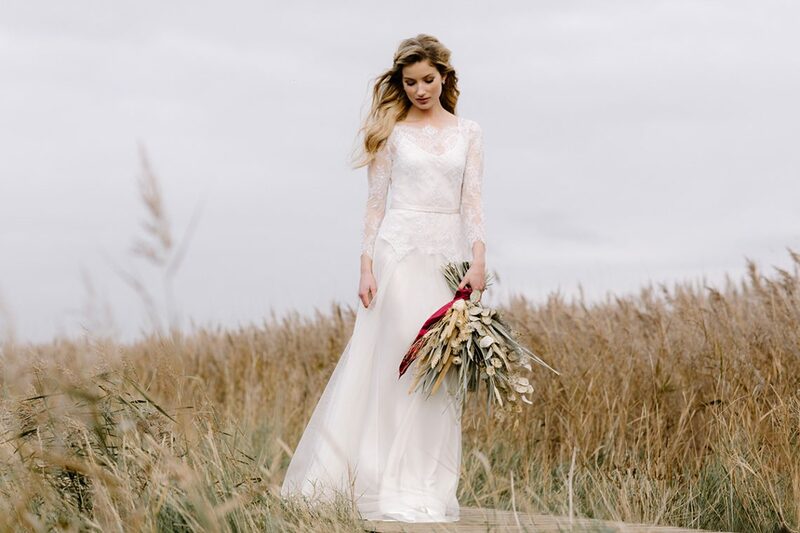 We are celebrating the latest collection of stunning wedding dresses by Luella’s Bridal and have created some delightful inspirations for you based on our favourites. B.LOVED Editor in Chief and Stylist to many lovely wedding brands, Louise Beukes, shares her concept, GOLDEN SPIRIT. She talks about the biggest wedding trends of 2018, Pampas Grass, with a moodboard showcasing how to work this with contemporary floral designs and statement installations! B.LOVED Editor Catharine Noble, shares what she thinks is another big wedding trend, the return of the Rustic wedding, in her concept RUSTIC REVIVAL. We’d love to know if you love this new take on this style! Finally we have our new Writer Kimberley, the Event Designer behind The Wedding Avenue and she shares CITY CHIC for a modern wedding with a fashion forward bridal look! I chose the French inspired beaded lace Nieve Dress, I just loved the classic and sophisticated shape with a lace top and fabulous tulle skirt. The skirt is actually made using over 16m of super fine, soft flowing tulle and I can only imagine how beautiful this medium train moves too! 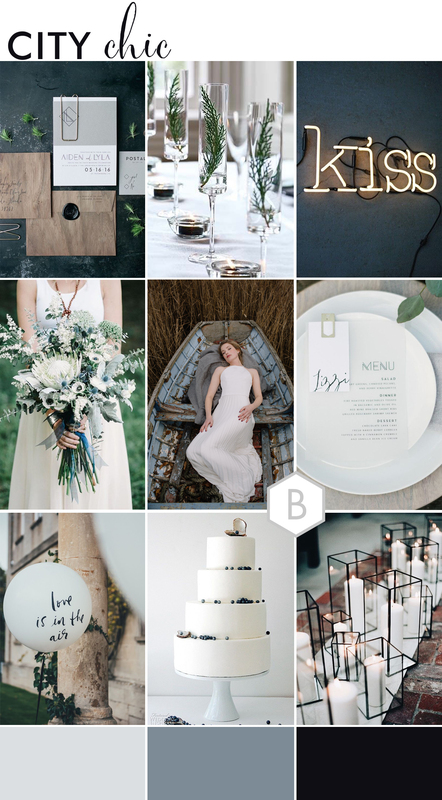 I’m totally seeing a new, modern take on the Rustic Wedding style appearing and it’s perfect for this look. To me the Rustic Revival is more a lean towards the Fine Art wedding, with lots of floral details, using beautiful foliage and it suits lovely modern barn venues, and garden weddings held at historical venues! Inspired by the bridal image of the Nieve Dress, I imagined fields of gold and this influenced the colour platte. I adore light filled weddings with cream and white tones with elegant neutrals and carried this throughout the details including the creative floral designs. Introducing pops of this pretty peach – salmon pink colour with a hint of brown too. Nieve, with its beaded lace design and super fine, soft flowing tulle skirt, is the perfect dress for brides wanting to combine bohemian styling with a touch of luxe. 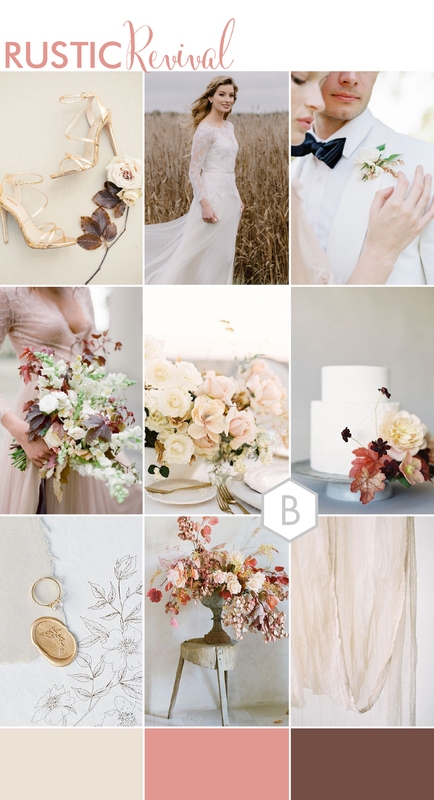 Inspired by the laid-back elegance of the gown, this mood board combines a classic wedding palette of blush and gold with relaxed florals, and on-trend details. 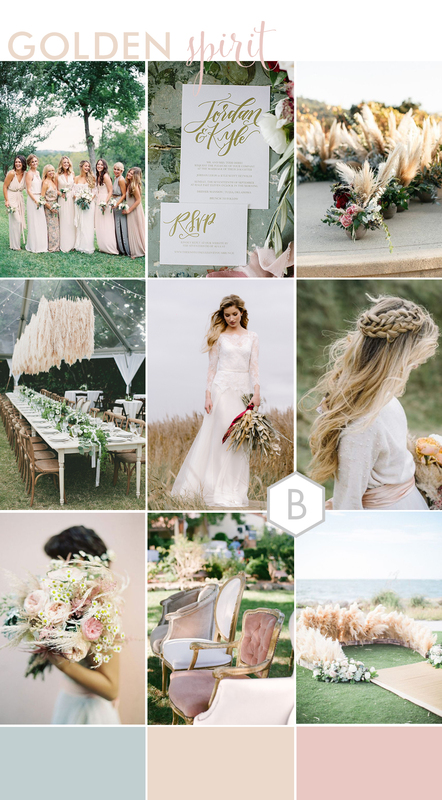 I’d coordinate the bridal party in soft neutral shades with boho waves and braids in keeping with the understated sophistication of this look, where everything is perfectly coordinated yet loose and a little bit wild. One of 2018’s biggest trends, pampas grass, fits perfectly with this look. You can almost sense the tall, frothy fronds swaying in the gentle summer breeze! Whether creating a circular ceremony area, suspending from the ceiling for a wow-factor table centrepiece, or weaving delicate strands into a bouquet, this 70’s fave is showing off is beauty and versatility in a big way! Inspired by the Amber Dress – a modern backless design made from cream Japanese handmade silk and features Luella’s trade mark pleated skirt. It’s stunning beaded straps are a mixture of milky white, blush and ivory tones, it’s perfect for the modern, fashion forward Bride!